The Clearvent a roof mounted louvre natural exhaust ventilator that can extract large volumes of warm, stale or contaminated air. Aerodynamically designed to maximise efficiency and throughput. Ideally suited to areas requiring a large exhaust opening, such as factories or commercial areas where heat would otherwise cause unrestricted internal temperature rise. In the open position these units provide almost clear daylight openings and consequent psychological relief to personnel working in an enclosed environment. Interlocking blades are fitted with energy conserving draught strips to minimise heat loss when closed. 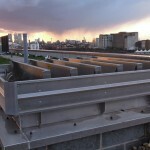 The ventilator construction has integral rain discharge channels. 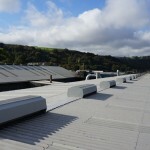 The unit has an integral base skirt to fix down and flash to all types of building structures including roof upstands. 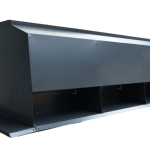 Manufactured using aluminium BS EN 485 alloy, louvre blades, drainage channels, control arms and actuators are secured to the main ventilator body. Available in throat widths ranging between 460mm and 1676mm, and with throat lengths from 834mm up to 2836mm.